Basing Lodge is delighted to announce that following a very successful Ladies Night we have raised £1100 which this year is going to the St. Michael's Hospice. We were honoured with an official visit from the APGM - W.Bro Roy Quin, Grand Lodge officers and Officers of Provincial Grand Lodge, as well as our 31 Members of Basing Lodge and 25 Visitors attending. 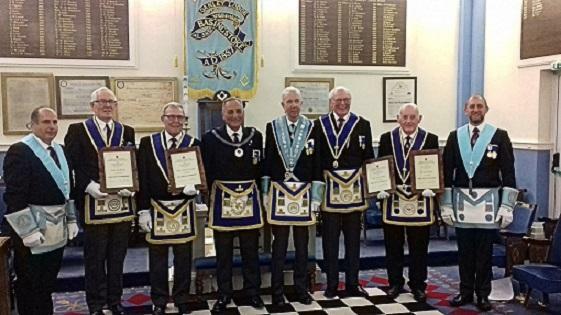 Just prior to Stephen Hartley's Initiation, the chair was taken briefly by APGM- W.Bro Roy Quin for the next items and the presentation of 40 year Certificates and lapel pins to Bro John Schulze, W.Bro's Norman Barber, David Bolton and Paul Reavley and our Visiting Officer, W.Bro George Plumbly. The chair the rightfully handed back to the WM, Stephen Hartley's initiation ceremony proceeded. TheObligation was given by the WM, the North East Corner was presented by W.Bro Stuart Rain, Bro Darren Hitchcock presented the Working Tools and W.Bro Alec Ness gave the Charge after Initiation. 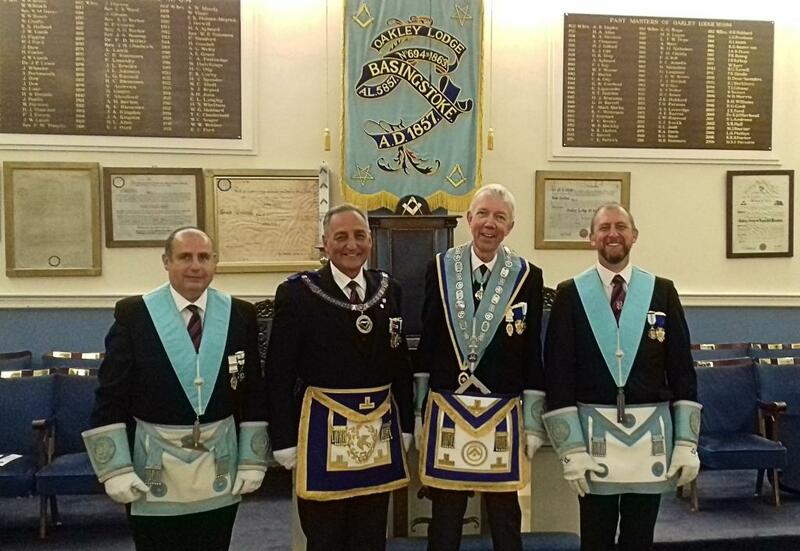 Brother Initiate accompanied with the APGM and WM after the closing of the lodge. APGM - WM and the Junior and Senior Warden. We also received Proposals that 2 new members join our Lodge. One is currently a Berkshire Freemason who resides in Basingstoke and the other is a neighbour of one of our members, who asked to join at a recent North Central Area coffee morning. The After Proceedings were well supported and the main course was quiche, salad and new potatoes. The Raffle raised £277 which will go towards the Lodge Benevolent Fund. 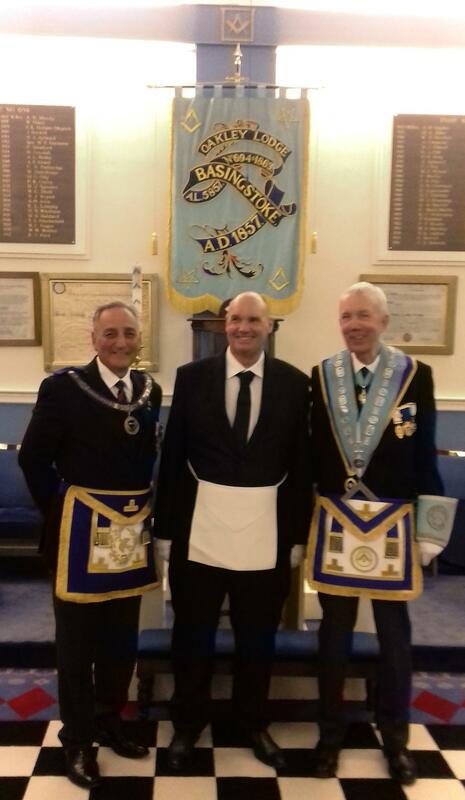 W.Bro Norman Barber who organised the St Georges Night along with Bro John Schulze reported that the evening was a great success with £709 being raised during the evening which will go towards the WM nominated charity - St Michael's Hospice in Basingstoke.